Senior Goalkeeper Nicole Ulrick, who tore her ACL in the first game of last year's season, has made a powerful comeback to a starting position in GW women's soccer team. An ACL injury is season-ending. A second one could kill a career. Diving to stop a cross-shot in a scoreless season opener against Georgetown last year, then-junior goalkeeper Nicole Ulrick landed awkwardly on top of a Hoya forward. As she was carried off the field by her teammates, Ulrick knew she was injured, but did not yet know how badly. After the eventual 2-0 loss in what was just Ulrick’s third game starting in goal for GW, she learned she had torn her ACL – just like she had in high school. ACL tears are ugly injuries, usually keeping players out for at least nine months, and sometimes for good. “My heart kind of broke for her. I remember thinking, ‘Gosh, she’s now going to be through her junior year and she really hasn’t had that chance [to live up to her ability]’,” said head coach Sarah Barnes. In what would be her first full year in goal, Ulrick is back this season – the anchor of a women’s soccer team relying on a staunch defense to lift it to a turnaround year. The goalie looks for revenge Friday against the Hoyas – a team the Colonials have not beaten since 2003 – in the women’s soccer team’s second game of the season. 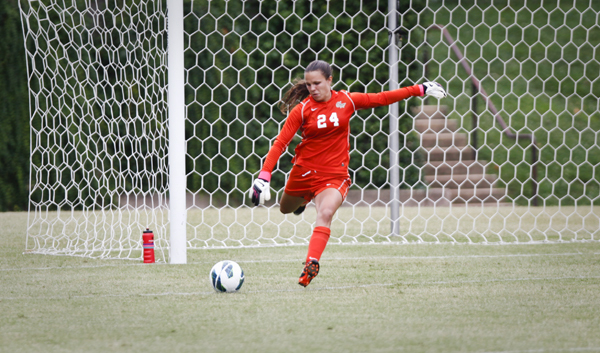 GW picked up a 1-0 opening win against American last week, with Ulrick notching three saves. “It was exciting to be back, and every game I’m just grateful that I get to play one more season. Everything is holding together,” Ulrick said. Four years ago, as a junior in high school, Ulrick tore her ACL for the first time and was forced to sit out the rest of the year. At the end of her senior high school season, Ulrick had paved the way for her team to reach the Pennsylvania state semifinals – the kind of achievement she hopes to reach again with her fellow Colonials. Looking forward, Ulrick said she feels confident going into the season. The rehab process was quick, she said, with GW’s medical staff helping her understand when a pain was just a normal ache or when she needed to taper down. She was ready to play by the spring of her junior year – after the season was already over – just nine months removed from the injury. Still, Barnes and staff were hesitant to loosen the reins. Barnes said she couldn’t afford to let Ulrick get injured during the spring offseason, especially because she wanted to give the goalie a chance at redemption. That stubbornness showed Barnes that Ulrick was the kind of player who could change the culture of a team that has not made the Atlantic 10 Championships since 2002. Ulrick talked passionately about creating a lasting culture on a team in which building trust will help performance. To do so, she has her focus on the field and off of her injury.